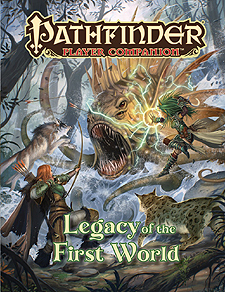 All the trickery and power of the fey are yours to command with Pathfinder Player Companion: Legacy of the First World. Let the wilderness inspire your heroes with a spectrum of new ways to play fey-touched characters, along with new powers for classes seeking to strengthen their bonds with nature. Choose whether you draw your might from the vitality of the land, the brutality of vicious beasts, or even your faith in the fey realm's inscrutable masters, the Eldest. Character options for worshippers of the enigmatic Eldest, allowing members of all classes to manifest their god's influence in unexpected ways.